Solution Saddles Customer Stories: The versatile Solution saddle will now be the saddle of choice for Geraldine since trying one for the first time. The versatile Solution saddle will now be the saddle of choice for Geraldine since trying one for the first time. Evie is just 12 years old and her fabulous 14hh pony ‘Triggs’ is 20! Triggs loves Eventing and they compete at BE90 level; they nearly always have a double clear and finish on their dressage score but unfortunately dressage is their worst phase. Previously, Triggs hated dressage and would not go forward, his head was in the air with a hollow back and incorrect bend. One day, Evie’s dressage trainer suggested she take off the saddle and just ride on the pad - he is a great believer in treeless saddles and thought it would help. A miracle occurred; Triggs lowered his head down with a lovely stretch and was moving forwards on his own without constant kicking from Evie, so we immediately started looking for a used Solution saddle. With the help of an Approved Advisor from Solutions Saddles the saddle fit was customised for Triggs and he continues to improve every day. I would even go so far as to say he enjoys his flatwork sessions now - no more kicking required from Evie so she can concentrate on sitting better and improving her contact. 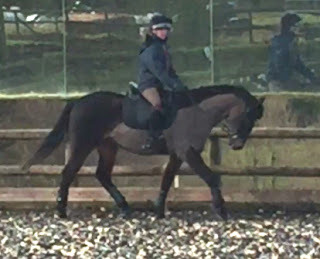 Evie says he is much nicer to ride and much happier in himself. His jumping has also improved because I think he is much more comfortable - at the moment he is the best he has ever been. The Solution Saddles Approved Advisor also fitted the saddle to Evie’s almost outgrown but absolutely gorgeous 12.2hh pony, Princess, and I think that they will now go out and do some dressage competitions. Princess has always been difficult to fit but the Solution saddle is just great on her! This really is the most versatile saddle as it also fits our young home bred 16hh warmblood cross, out of our event mare by Grafenstolz. We will use it on him all the time as he changes shape and grows. Evie is hoping he may be her next ride so she will be well used to the saddle. We have never thought of using a treeless saddle before but I think a Solution saddle will now always be our saddle of choice." Triggs is so well at the moment I can’t believe he is 20. I am certain your saddle has been instrumental in making him so energetic. He just feels so full of joy.